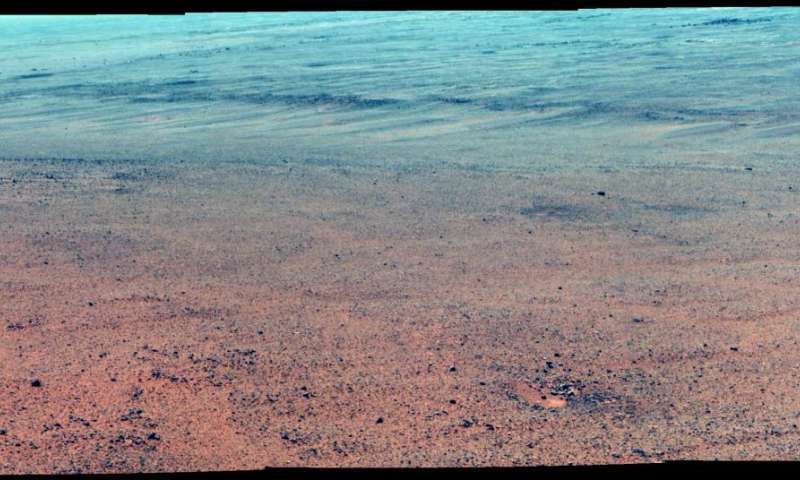 The Pancam on NASA's Mars Exploration Rover Opportunity took the component images of this enhanced-color scene during the mission's "walkabout" survey of an area just above the top of "Perseverance Valley," in preparation for driving down the valley. Credit: NASA/JPL-Caltech/Cornell/Arizona State Univ. NASA's senior Mars rover, Opportunity, is examining rocks at the edge of Endeavour Crater for signs that they may have been either transported by a flood or eroded in place by wind. Those scenarios are among the possible explanations rover-team scientists are considering for features seen just outside the crater rim's crest above "Perseverance Valley," which is carved into the inner slope of the rim. The team plans to drive Opportunity down Perseverance Valley after completing a "walkabout" survey of the area above it. The rover's drives now use steering motors on only the rear wheels, following a temporary jam of the left-front wheel's steering actuator this month. Opportunity has not used its right-front wheel's steering actuator since 2005, the year after it landed on Mars. "The walkabout is designed to look at what's just above Perseverance Valley," said Opportunity Deputy Principal Investigator Ray Arvidson of Washington University in St. Louis. "We see a pattern of striations running east-west outside the crest of the rim." "We want to determine whether these are in-place rocks or transported rocks," Arvidson said. "One possibility is that this site was the end of a catchment where a lake was perched against the outside of the crater rim. A flood might have brought in the rocks, breached the rim and overflowed into the crater, carving the valley down the inner side of the rim. Another possibility is that the area was fractured by the impact that created Endeavour Crater, then rock dikes filled the fractures, and we're seeing effects of wind erosion on those filled fractures." Close examination of the rock piles along the edges of the possible channel might help researchers evaluate these and other possible histories of the site. Meanwhile, the team is analyzing stereo images of Perseverance Valley, taken from the rim, to plot Opportunity's route. The valley extends down from the crest into the crater at a slope of about 15 to 17 degrees for a distance of about two football fields. On June 4, during the walkabout survey, the steering actuator for Opportunity's left-front wheel stalled with the wheel turned outward more than 30 degrees. Each of the rover's six wheels has its own drive motor, which all still work after about 27.9 miles (44.9 kilometers) of driving on Mars. Each of the four corner wheels also has an independent steering actuator—including motor and gearbox. The rover has driven about 25 miles (40 kilometers) since losing use of right-front wheel steering in April 2005. "For at least the immediate future, we don't plan to use either front wheel for steering," said Opportunity Project Manager John Callas of NASA's Jet Propulsion Laboratory, Pasadena, California. "We can steer with two wheels, just like a car except it's the rear wheels. We're doing exactly what we should be doing, which is to wear out the rover doing productive work—to utilize every capability of the vehicle in the exploration of Mars." Right, but that doesn't mean there wasn't once much more hydrogen than there is now.
" ...These kind of carbonates only form when there is a lot of water. ..."
"...Frozen water also lies beneath the surface. " so saying its a "futile search for the fictional water. " is nonsense. Nobody jou, not defend, that you live in faith and delusion. Now it is so, there is no (not just the evidence) is already an indication of the existence of water on Mars (except smart heads). Science are evidence , stories are for believers who are not interested in evidence. Lead is not in the atmosphere (there is "The chemical composition of its atmosphere is: carbon dioxide 95.97%, argon 1.93%, nitrogen 1.89%, oxygen 0.146%, carbon-monoxide 0.0557%, which in total Makes 99.9917% of the elements and compounds, present in its atmosphere. "). But when you say there are Bogey on Mars, we will believe who cares for the evidence.
" When certain smart people realize that there can be no water without hydrogen, maybe then will they stop writing about water on Mars and stop this massive, yet futile search for the fictional water." "Using an imaging spectrometer on MRO, researchers detected signatures of hydrated minerals on slopes where mysterious streaks are seen on the Red Planet." ""It took multiple spacecraft over several years to solve this mystery, and now we know there is liquid water on the surface of this cold, desert planet," said Michael Meyer, lead scientist for NASA's Mars Exploration Program at the agency's headquarters in Washington." Water on Mars is NOT fictional and the search for it is NOT futile. It is a CONFIRMED FACT. "And your figures on the composition of the Martian atmosphere are incorrect."